The PortaPack is a US$220 add-on for the HackRF software defined radio (HackRF + PortaPack + Accessory Amazon bundle) which allows you to go portable with the HackRF and a battery pack. 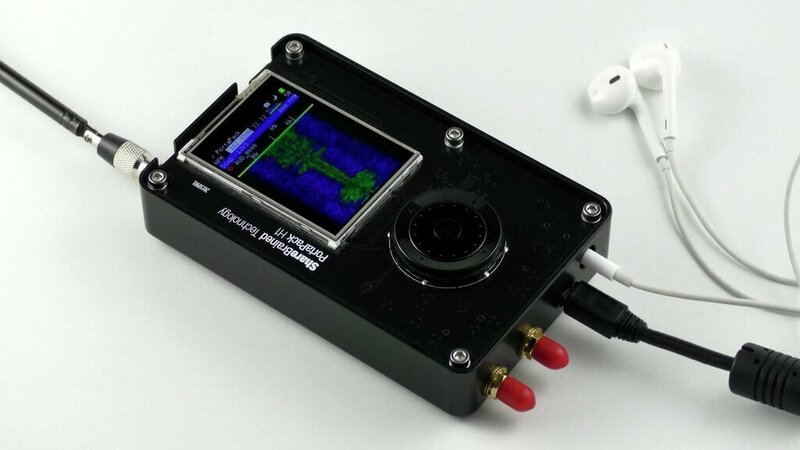 It features a small touchscreen LCD and an iPod like control wheel that is used to control custom HackRF firmware which includes an audio receiver, several built in digital decoders and transmitters too. 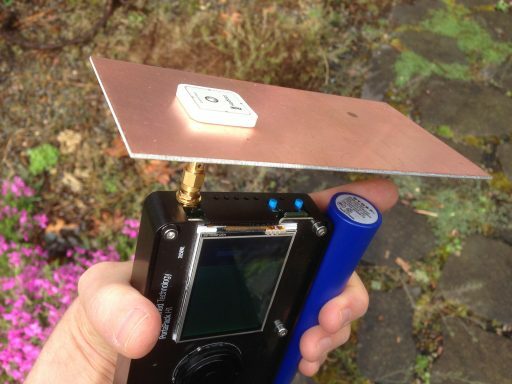 With the PortaPack no PC is required to receive or transmit with the HackRF. Of course as you are fixed to custom firmware, it's not possible to run any software that has already been developed for Windows or Linux systems in the past. The official firmware created by the PortaPack developer Jared Boone has several decoders and transmitters built into it, but the third party 'Havoc' firmware by 'furrtek' is really what you'll want to use with it since it contains many more decoders and transmit options. As of the time of this post the currently available decoders and transmit options can be seen in the screenshots below. The ones in green are almost fully implemented, the ones in yellow are working with some features missing, and the ones in grey are planned to be implemented in the future. Note that for the transmitter options, there are some there that could really land you in trouble with the law so be very careful to exercise caution and only transmit what you are legally allowed to. More Havoc firmware screenshots from the GitHub page. Although the PortaPack was released several years ago we never did a review on it as the firmware was not developed very far beyond listening to audio and implementing a few transmitters. But over time the Havok firmware, as well as the official firmware has been developed further, opening up many new interesting applications for the PortaPack. Doing a replay attack on a wireless keyfob using the PortaPack. One of the best things about the PortaPack is that it makes capture and replay of wireless signals like those from ISM band remote controls extremely easy. To create a capture we just need to enter the "Capture" menu, set the frequency of the remote key, press the red 'R' Record button and then press the key on the remote. Then stop the recording to save it to the SD Card. Now you can go into the Replay menu, select the file that you just recorded and hit play. The exact same signal will be transmitted over the air, effectively replacing your remote key. We tested this using a simple remote alarm system and it worked flawlessly first time. The video below shows how easy the whole process is. 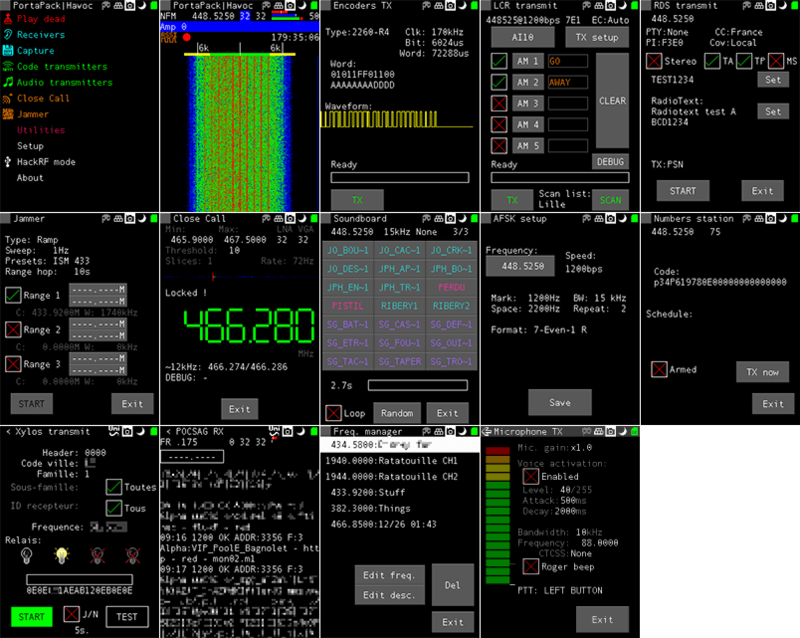 The PortaPack is an addon created by Jared Boone for the HackRF software defined radio. It costs $200 USD at the sharebrained store and together with a USB battery pack it allows you to go completely portable with your HackRF. The HackRF is a multi-purpose SDR which can both receive and transmit anything (as long as you program it in) from 1 MHz to 6 GHz. Since we last posted about the PortaPack many new features have been added, and the firmware has matured significantly. Now the official PortaPack firmware allows you to receive and demodulate SSB, AM, NFM, WFM and display up to an 18 MHz wide waterfall. You can also decode marine AIS, the automobile tyre pressure monitoring system (TPMS) and utility ITRON ERT meters. an OOK transmitter – control on-off-keying devices such as doorbells. Below we’ve created a YouTube playlist showing several videos that show the portapack in action. And below we show a tweet from @furrtek showing off the recently added SSTV transmit feature, and a tweet from @giorgiofox showing off the microphone transmit feature. 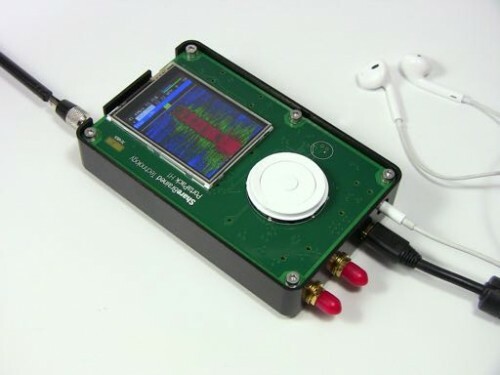 The HackRF PortaPack is a portable LCD screen with control interface and processor that connects to a HackRF software defined radio. The PortaPack’s goal is to allow for portable RF spectrum visualization, tuning and eventually demodulation of many modes. It has been in development from around the time of the August 2013 HackRF kickstarter and is now almost ready to be shipped out to the initial backers. For more information about the PortaPack see this Hak5 segment that we previously posted about where Jared Boone the inventor of the PortaPack is interviewed. Getting the PortaPack H1 ready for shipping was a long slog. And as is my way, I took a lot of detours along the way. I incorporated a lightweight operating system (ChibiOS) into the firmware. I built a simple UI framework that would support arrow-key navigation, with touch as an option where appropriate. I developed a sophisticated test jig (based on this) to ensure the units I ship work correctly. I designed a milled aluminum case that I’ll offer as an option. And I finished and tested all the units myself, including doing failure analysis on a bunch of PortaPacks. I learned a great deal, and hope that my next product development cycle will be much easier and faster. Because of all the manufacturing effort, work on the firmware hasn’t advanced very far. At this point, the PortaPack is mostly useful as a basic narrowband AM/FM receiver. But there’s still a lot of capability to be tapped in the HackRF ARM processors! I’m eager to get back to firmware, and implement more signal analysis and capture functionality, along with some digital modes demodulation and decoding support. In this Hak5 episode Darren discusses the HackRF PortaPack which is a portable LCD screen device that connects to a HackRF SDR and allows portable frequency spectrum visualization. The PortaPack is currently under development and in the future it will allow demodulation of multiple audio modes and possibly digital demodulation and recording capabilities as well. 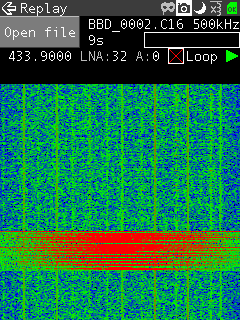 Later in the episode Shannon presents a tutorial on HDSDR, an SDR GUI alternative to SDR#. She shows how to install and use the HDSDR program.